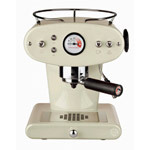 The FrancisFrancis X1 Espresso Coffee Machine is in it's third generation of production. The original one! The most popular X1 in the UK! Super stylish design by Italian architect, Luca Trazzi. The looks have been tweeked a little, however the much admired iconic design is still there in all it's magnificence. 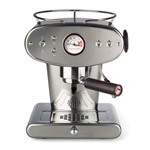 The Ground X1 offers superior performance and produces a much improved serving of espresso and cappuccino. Available in almond, red, black, deep blue, light blue, yellow, orange and shiny stainless steel. We've tried it! We like it! We're sure you'll be delighted too. FrancisFrancis have now made the 3rd generation TRIO POD machine available in the UK, this machine takes the pods and cannot be made to take either ground or capsules. The pods are readily available, they are quick, clean and easy to use, offering great results every time. The pod has been devloped over many years and offers the exact dosgae amount, tamped to perfection and ready to use in your TRIO machine. Available in almond, red, black, almond and stainless steel. 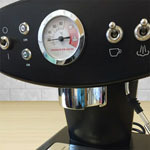 FrancisFrancis have now added their patented iperEspresso capsule technology to the ever popular X1 machine. The capsules are quick, clean and easy to use, offering great results every time. Available in almond, red, black, stainless steel. The FrancisFrancis X7.1 is the latest addition to the iconic and innovative coffee machine range by, coffee giants, illy. Designed, as the X1 machine, by Italian architect Luca Trazzi. 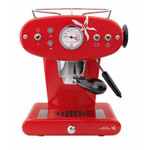 Makes great espresso, froth milks with steam wand for cappuccino and latte drinks. 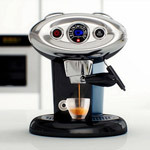 The stylish X7.1 uses iperEspresso coffee capsules only, producing coffee with great flavour, aroma and crema. Easy to use, easy to clean, looks stunning and a great price. Available in three colours, red, black and white. Serviced and refurbished in-house by CraystoneShop. Our latest batch of refurbished X1 machines are ready to be listed on the site, machines that we have taken great care to present in a good as new condition. Many new parts fitted, manually descaled - as good as new! Supplied with 12 months warranty - be quick, first come first served!